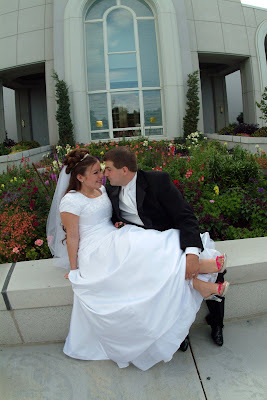 My sweet hubby and I have now been married for 4 years!! I just wanted to take a minute to say how thankful I am to have such a wonderful husband. He really is amazing! He is always helping me out if not doing the majority of the housework! I am so lucky to have a husband who provides for our family and loves what he does at the same time. He is such a wonderful dad to Landon also. I am so greatful that I get to be with him for eternity! Thanks for putting up with me babe! It was Landons 1st day of preschool today! He was SO excited. He had a blast on his first day. It was funny though we asked him what his favorite part of preschool was and he said. . . Playing with Hy Hy. Its so fun that he gets to go to preschool with his best buddy and cousin Hyrum. 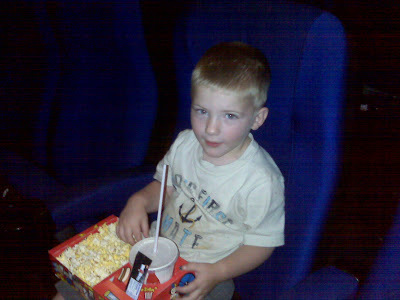 We took Landon to see G-Force in 3-D the other day. It was alot of fun! We went early in the day, so it was just us and and another family. Landon was squealing the whole time! It was a fun adventure! 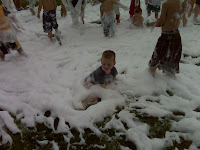 Landon playing in the foam. Brett and Landon posing for me. Landon rolling around in the foam. 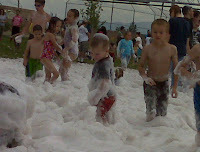 Lehi had its first annual "Foam Days" on the 24th of July. 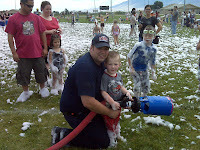 The fire department got put in charge of it, so Brett got to be the guy who was spraying the foam. All the kids (and adults) loved it! Landon thought he was pretty cool trying to help Brett spray the foam. It turned out to be a real fun day! They had a bungie bouncy thing at the festival. Landon begged Grandpa Dave to let him go on it. Grandpa caved in and let him go on it... We were all scared because he went so high! Landon anxiously waiting for Stadium of Fire to start. Landon clapping his hands while SheDaisy sang. Land screaming for the Jonas Brothers. Land decided the fireworks were a little loud and wanted his daddy to cover his ears. This is a video of Landon on our way to Stadium of Fire chanting because he was so excited! 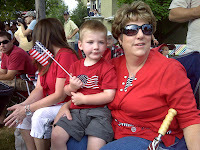 The Fourth of July Parade was so fun! We found the perfect spot to sit the day before. It was right by one of best friends, Heidi, and her family. We had plenty of room so we sat with my mom and dad and Justin, as well as Bretts parents. It was a really good parade! It was especially fun see Morgan with her UVU cheer squad, Kalyn marching with her pipe band and we also got to see both of Bretts little brother marching with the AF band. It was a fun morning. Land and my awesome mom! Justin and Kayln. They just got off of work. They are so cute! We started off the holiday weekend by having a BBQ with my family at my mom and dads house. It was so fun! We made our own shishkabobs. My dad is always so creative! It was a blast! No fun that he got called out to a house fire before we got to eat, and didn't get back till really late! My sweet husband turned 28 on the 1st of July! Landon and I started out the day by making his favorite thing for him for breakfast, biscuits and gravy. Then Brett had to go take a test for the fire department, which was lame cause it took 2 and 1/2 hours! But that night we went out to dinner with my family to Brett's favorite restaurant, Texas Roadhouse. He was a little nervous one of us would spill the beans and tell it was his birthday. (he didn't want to ride the saddle) Anyway Happy Birthday Brett! We Love You! Landon had such a fun 3rd birthday! We let him choose anywhere that he wanted to go to lunch, and of course he chose McDonalds so that he could play, then he got to play with his favorite aunt, Morgan, while mom and dad finished a little shopping. Then to end the day we had a little party at the park. He had a Thomas pinata, ice cream cake, presents and all his family. It was such a good day! This was Landons first plane ride. I was a little worried about how he would do and if he would be scared. But he wasn't he was such a big boy and did so great. They only problem was that he was expecting to see Mickey Mouse right when we landed. Of course we had to stop at the Disneyland fire station so Brett could play firefighter for a minute. The Three Amigos ready to hit Disneyland hard. We had so much fun taking Landon to Disneyland for his first time! Landon loved almost all of it. (He was afraid of the pirates on Pirates of the Carribean). We had a blast hitting all the hot spots along the way. We went to Knottsberry Farm, Universal Studios, the beach, Sea World and we even stopped in Vegas and took Land to the Kings Tournament. (He thinks he is a knight now.) We went with Bretts whole family. They are party animals! We were exhausted by the time we got home.